Podium Prep is run by Andy Jebson, a motor technician with not just 12 years experience in the mainstream motor trade but also a lifelong love of motorsport. Andy has worked with main dealerships for Audi, BMW and Volvo as well as preparing a myriad of trackday, race and rally vehicles. Reliability is the keyword that underpins all Andy's work. He says "Whether it be for race or road a car has to complete its journey or it is useless". Podium Prep is based on Binbrook Trading Estate, Lincolnshire in the old technical section of former RAF Binbrook, they operate a workshop and mobile service and are handily situated for Cadwell Park, Louth, Grimsby and Market Rasen areas. 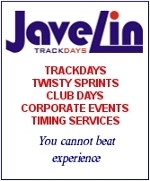 Podium Prep carry out contract servicing for a number of companies, motorsport and trackday enthusiasts including Track Car Hire Specialists Javelin Trackdays. Their Circuit Controller Bob Willatt says "Our fleet of safety cars need to work first time every time. Thanks to Podium Prep, they do." Copyright © 2010 Podium Preparation.